We are, of course, celebrating with a hop, so if you're hopping with us, you should have arrived here from Heather's blog. For a full list of the hop lineup, or if you've lost your way, please visit here. One of my personal favorites is the Inverted Stitched Scallop Circles dies. 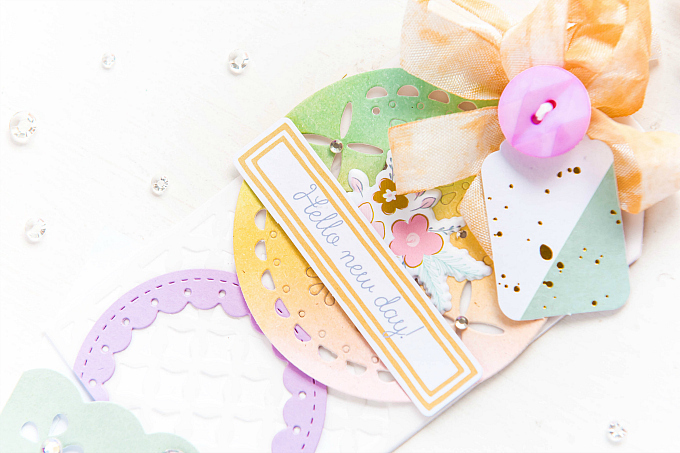 What's special about these dies is that they are convertible and can be used as a window/shaker cut, or combined with the outer circle for a pretty scalloped frame. Here, I used both the outline cut, as well as the inverted scallop die, to cut a lilac accent frame for my tag. 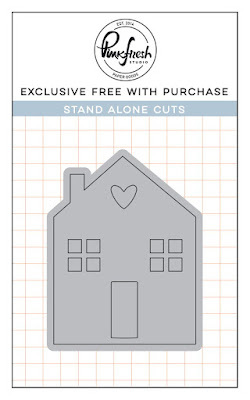 You could easily cut a bunch of these (in both sizes) and layer them around your card background for a really fun look. I also used the gorgeous new Classic Tags with Fillable Elements, and oh my goodness...I LOVE this set of dies! There are heaps of pretty ways you can mix and match these elements. 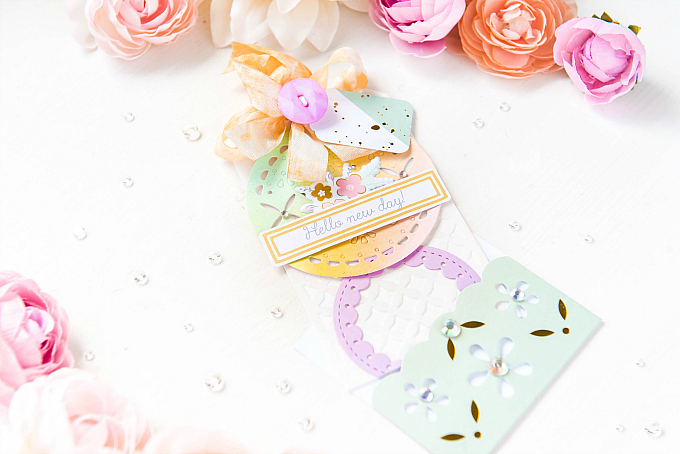 Each of the three tags come with a heap of decorative elements that you can use to die-cut fancy inner designs with. The best part is that you can use these little accent dies with or without the tags. I used one of the rectangular dies in the set to make the base of my tag, and then I used it again to cut out a matching vellum piece. But for the vellum, I also used one of the inserts to cut this gorgeous diamond pattern. I tucked the tag into this sweet little pocket from the Everyday Musings Journalling Pockets. Next, I blended some ink onto white cardstock, and then used the circular tag in the set to make my accent piece. As you can see, I had way too much fun adding all the little inner cuts! I also thought it would be fun to pop some of the cut pieces out, while leaving others intact. I love the variation it creates. 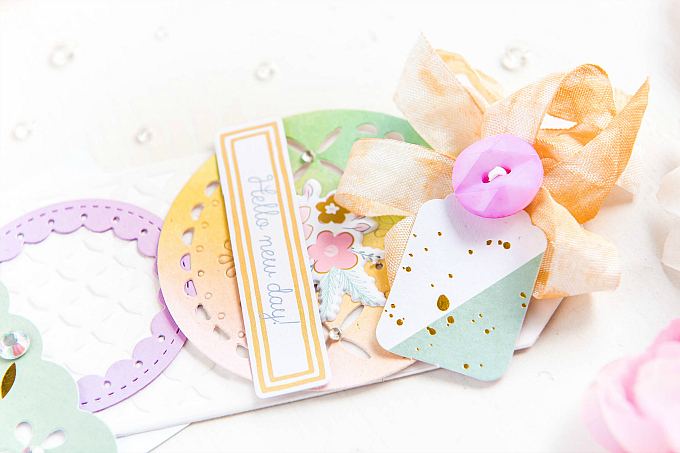 To decorate the rest of the tag, I used Joyful Day Puffy Stickers for the florals, Joyful Day Ephemera for the sentiment, and Everyday Musings Ephemera for the mini tag. Next up, I focused mostly on the Inverted Stitched Scallop Circles dies. 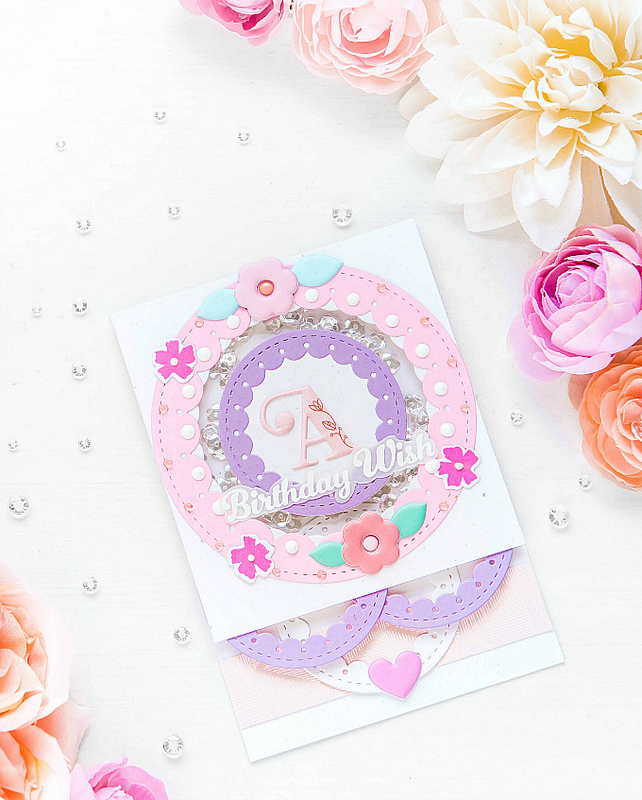 For this fun card, I decided to use only cardstock for my die-cutting, so you could see just how much fun it is to mix and match all these fun circles, and how just a few layers can totally elevate the look of simple cardstock die-cuts. I started off by making my card front. I used the larger circle in the set to cut out a window from a white cardstock piece, which I backed with some acetate. I then used some pink cardstock to cut out the same circle, but this time, with the outer cut, so that I could use it as a frame for my card front. If you look closely, you'll see that I offset it a bit when I adhered it down. I used a few puffy florals from the Joyful Day Puffy Phrase Stickers set. I then cut to smaller scalloped circles out of lilac cardstock, and backed one with white, and added a puffy letter from the Everyday Musings Puffy Alpha Stickers set. I snipped the other lilac circle in half, and adhered it at the bottom of my card front. I decorated the frame with Nuvo drops, and a couple of little florals and sentiment from the Make A Wish stamp set. I adhered the decorated card front onto a card base with some foam squares, so that I could make a little shaker out of the pretty scalloped window. At the bottom, I also added another scalloped circle in white, a strip of pink paper, and a puffy heart. All orders will automatically receive this beautiful die while supplies last. No code required. 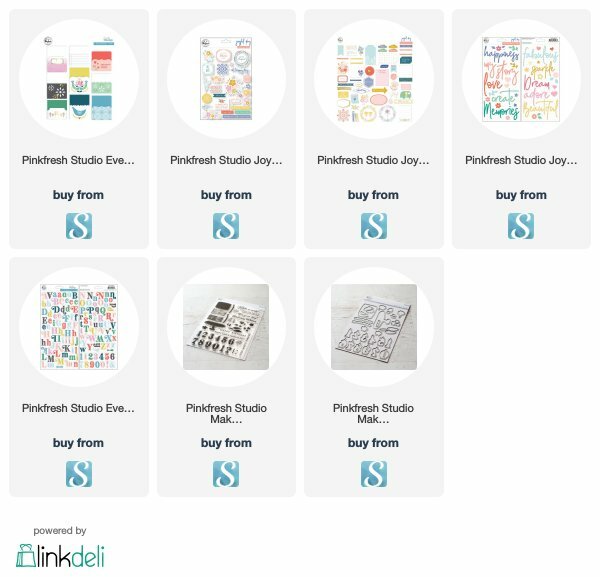 The entire April Essentials Release is up for grabs on the Pinkfresh Blog and on the Pinkfresh Instagram feed! 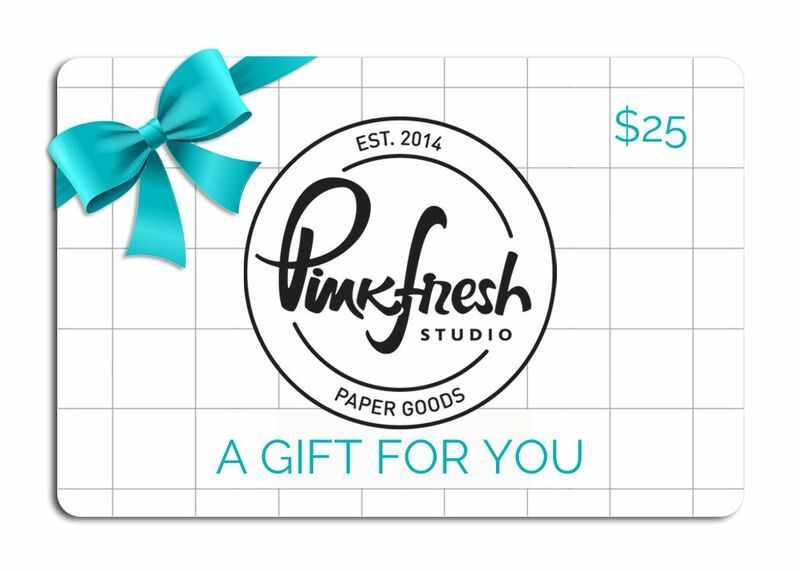 Each blog stop on the hop is also giving away a $25 giftcard. Simply leave a comment below for a chance to win! And don't forget to comment on the Pinkfresh Blog for a chance at one of the grand prizes. The winners for all the prizes will be announced Sunday, April 14th on the Giveaway Page. Please be sure to check the page and claim your prize within two weeks. Thank you so much for joining us today. Now be sure to hop along for more inspiration and prizes. Your next stop is the super talented Kelly Griglione. The inverted scallop circles you die cut in those beautiful colors look amazing. Your designs are stunning. The tag set is climbing my list! I really love how you used several different die pieces together on your projects. They look amazing! Beautiful card and tag! Love the colors. Such a great release. These are great and so much fun. Like you, I am loving the amazing products in this release. I really enjoyed seeing your beautiful creations. Absolutely gorgeous...loved your colors...thanks for sharing!! I love the colors, layers and textures on both your projects. Thanks for sharing. I am so excited about these dies, you’ve really shown how versatile they are! Thanks so much for the inspiration! Beautifully detailed and all the layers are awesome. I love the shaker! Gorgeous! 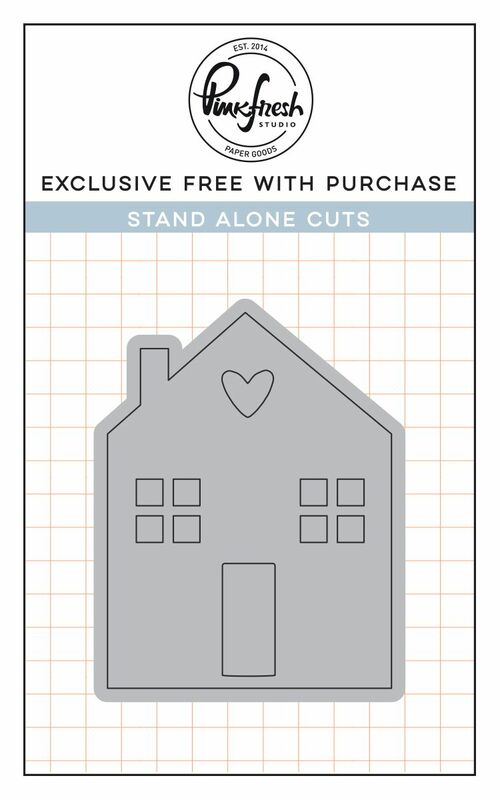 You’re right when you say that layering the die cuts takes the card to a new level. So pretty. Love your color choices. Such beautiful cards - love the colors! 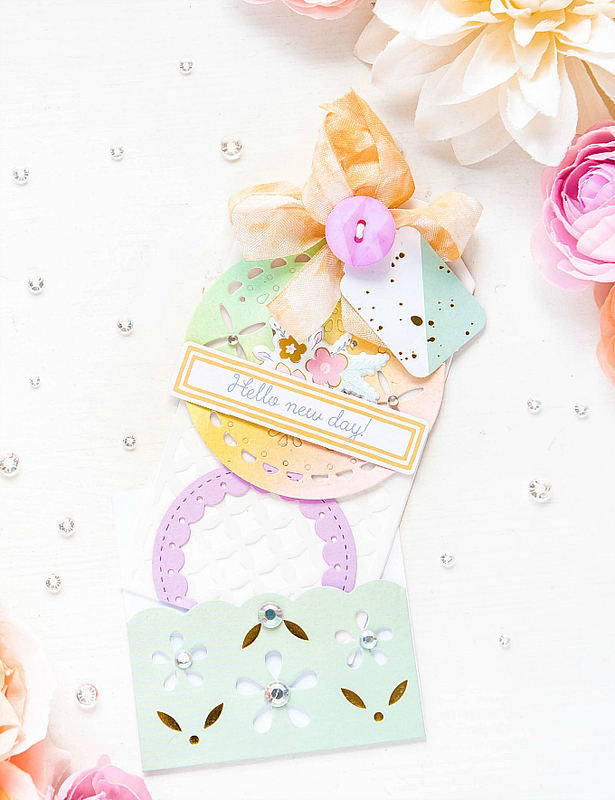 I think the tag with paint flecks is the perfect touch to your amazing card! Beautiful job! I love the colors and the tag is so pretty to look at with all the die elements. Beautiful card as well and I love how you used the circles. Gorgeous card and tag! Love how you used all of the pieces from these dies. These cards are fabulous! Love the new Essentials release from Pink Fresh. Loving your tag, it’s so sweet. Such beautiful colors used. Thanks for sharing your creativity! I agree the inverted stitched scalloped circle die is a great one with so many possibitities. A lovely cascading tag and your shaker is stunning! These are ever so dreamy Ivana! As always, you've layered up lots of sweetness and wonderful spring colors! Gorgeous designs and colors! And I love the pretty envelope, too. Such a pretty design and soft color palette. The pastels make it so Springy! Very clever and cute! Would be great for a baby card as well! These are fantastic!!! I love how you mixed and matched both sets and the colors are so pretty!!! 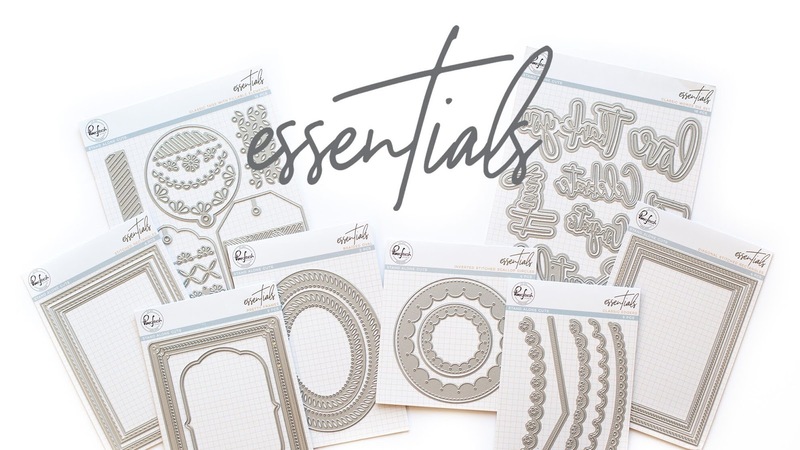 It was great seeing just a few of the ways to use these awesome dies!!! Great use of dies. Your colors are soooooo wonderful, so Spring like! The layers and texture look FAB! Simply amazing, the colors, the designs, I love send birthday cards, greet cards to family and friends, I refuse to use facebook as my Happy Birthday....these are amazing. Beautiful! Love all the layers and fabulous colors. Thanks for sharing the versatility of these dies. So beautiful, Ivana, the colours are so lovely! I am loving this release, especially the tags and the word dies! Oh, my goodness.....these are soooooooooo pretty!! Love how you used all the different elements in such creative ways. Everything looks so sweet and springy!! 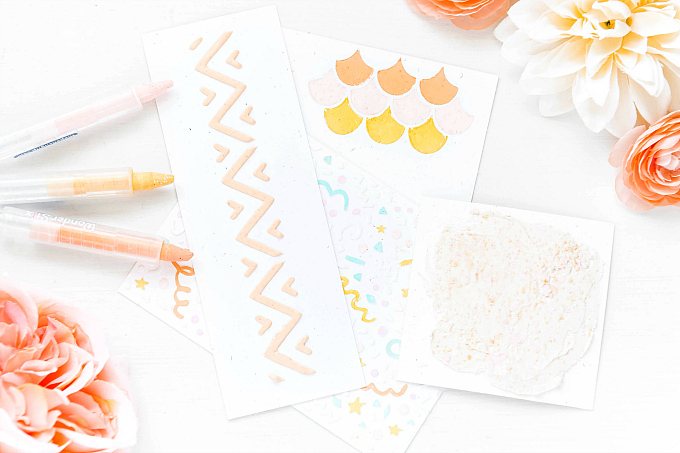 Lovely little notes with Pink Fresh! Fabulous projects!! Those pastel colors are beautiful! I'm so glad you used the tag dies. There are just so many options for mix-and-match that I have a hard time envisioning them all, so I appreciate seeing your way of using them. And I love your color choices; you are excellent at creating a spring feel! Love the beautiful, soft colors you used! Awesome creations with these beautiful dies! Fabulous! Sucn pretty, soft pastel colours, love them. The Essentials release is amazing. Got to LOVE convertible dies!! And at a fabulous price for all the Essentials too! Super unique project Ivana! So pretty! Love the pastel colours and the amazing layering. The new release is fabulous. I really love the new sentiment dies. So very pretty!! The colors are great!! Love your designs. So sweet and beautiful! Thanks for the idea. I love your mix and match style. So creative and so pretty. These look great! The soft pastels are perfect for spring. I REALLY like that shaker element on your card. The card is stunning! Love these soft colors and the different ways you used these fabulous dies! I would have never thought to layer all those and it looks so pretty. Thanks for the wonderful inspiration. I just love all of your cards! So beautiful! Love all of your cards especially the shaker card It is very unique. Thanks for sharing. These are such cute designs. I think the inverted scallop circle is going to be one of my favorites from this release. Wow, gorgeous creations! Love those beautiful pastel colors! So lovely!! Loved the colors! !